Disclaimer: Just Happiling did not receive any compensation in exchange to promote this event, other than exposure as part of the bloggers that are promoting it. Any and all opinions in the first 3 paragraphs are 100% our own. The rest of the post may contain affiliate links and opinions expressed by the host of the event, Love, Mrs. Mommy blog. At home, extra lighting is always welcomed. We live very busy lives now at days, and therefore, we tend to use the most out of our day, and end up getting home sometimes when the sun has already set. Having a well illuminated environment as we enter our home, is super essential not only to feel safe, but to watch were we are going. It is specially useful if you accidentally dropped your keys, phone, or any other item you were carrying home. However, leaving the light on all day so that it is on when you arrive home, is very unpractical and a waste of energy. This is why I love the motion sensor technology. Not only does it help you save on the bills, and be energy efficient, but it could also help curious intruders to stay away from your home. Because we can't help but look in the direction a light turns on, this action may alert neighbors that someone is at your door. And the sudden flash of light also works as a great deterrent of wildlife that attempts to sneak into your patio, or porch. 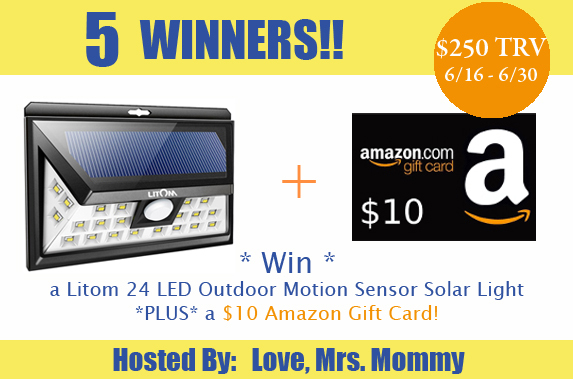 Want a chance to win some outdoor motion sensor solar lights for your home, plus an Amazon gift card? Just follow the instructions in the giveaway widget below. Five lucky participants will win, and we hope that some or all of them are coming from our blog. Remember to follow Just Happiling via social media, so that you can keep up to date with giveaway events such as this one, and more. Because sharing is caring, please share this blog post with your family and friends who you think would love to win too, and good luck! Disclosure: Love, Mrs. Mommy and all participating bloggers are not held responsible for sponsors who do not fulfill their prize obligations. This giveaway is in no way endorsed or sponsored by Facebook or any other social media site. The winners will be randomly drawn by Giveaway Tools and will be notified by email. The winners have 48 hours to reply before a replacement winner will be drawn. If you would like to participate in an event like this please contact LoveMrsMommy (at) gmail (dot) com. By entering this giveaway you acknowledge that you have read and agreed with the terms and conditions and to release any and all participating bloggers and social media venues from any liability.